'Suzani' derives from the Persian word for needle. 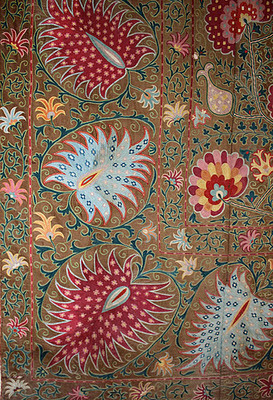 However, for textile lovers, the word is synonymous with the glories of Uzbek embroidery. 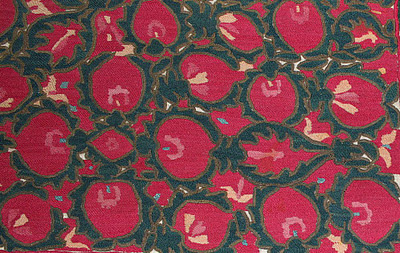 Stitched cooperatively by women and girls for centuries as part of their dowries, suzanis today remain a significant decorative and cultural art in Uzbekistan. Since the 2nd century B.C. Central Asia's great oasis cities absorbed designs from all over the Silk Road: Chinese porcelain, Persian carpets, Mughal embroideries and Islamic art all influenced the patterns so patiently stitched in these splendid wall hangings and covers. Major suzani centres evolved: Tashkent, Bukhara, Samarkand, Shakhrisabz and Nurata. 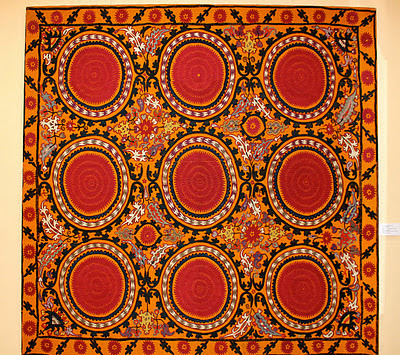 Each centre developed distinctive embroidery techniques, producing different effects. Motifs chosen were often the same across schools, albeit abstracted with differing stylistic features. Pomegranates are frequently used in suzanis: the many seeds symbolize fecundity and it is strongly associated with wedding rituals. The 'botum' motif, shaped like a teardrop or almond signifies abundance, while the chili pepper pattern is said to protect against the evil eye. Surrounded by deserts, lavish flowering garden scenes reminiscent of Persian 'garden carpets' were always popular: carnations, roses, iris and twining vines decorate the fabrics. The ewer is a recurring motif, representing the life-giving qualities of water. Large circular motifs, assumed to be sun and moon, are thought to derive from ancient Zoroastrian cosmological symbols crucial to agricultural communities. Leaves in vegetative patterns can be of several shapes: oval, serrated like lilac leaves, trefoil and cinquefoil. Garlands of leaves and rosettes are also widely used. A wavy stem of the trumpet-like bindweed signifies wealth and vitality. Some of the finest examples of suzanis are displayed in the Applied Art Museums of Tashkent and Bukhara, both of which are visited during Uzbek Journeys tours. Bukhara is my favourite place to purchase embroidery works: the range is astonishing of both old and new pieces, sewn on cotton and silks. At a private collection in Bukhara, you will see splendid antique pieces as well as fine examples of modern works. Roaming through the city's converted madrassahs and caravanserais will also provide opportunities to purchase suzanis directly from embroiderers. At Urgut market, near Samarkand, Uzbek women laden with new and old pieces will pursue you, pleading with you to purchase a suzani. I have bought excellent ones there (hard bargaining required) as well as at stalls in Shakhrisabz. To learn more about Central Asian embroideries, I recommend Christina Sumner and Guy Petherbridge's book Bright Flowers: Textiles and Ceramics of Central Asia.